SearchReSearch: Search Challenge (11/11/15): Fake or real? How do you know? Search Challenge (11/11/15): Fake or real? How do you know? ... people have been faking stories, photos, and claims for as long as humans have been around. Of course now we're aided by technology, which sometimes makes these deceptions a bit more difficult to ferret out. 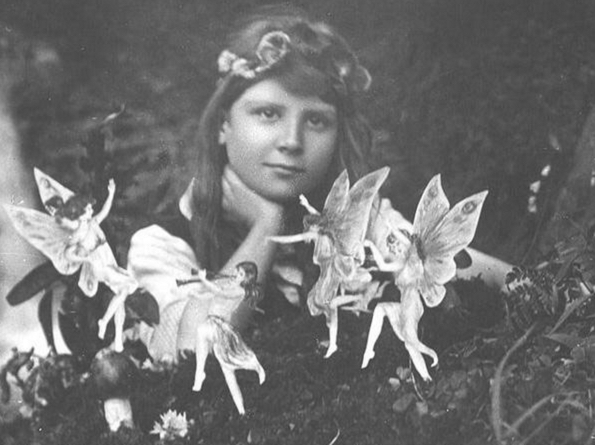 This is one of the images of the Cottingley Fairies. In 1920, a series of photos, supposedly taken by two young girls while playing in the garden, claimed to show that fairies really did exist. Even Arthur Conan Doyle, he of Sherlock Holmes fame, was taken in by the images. To our eye, these seem extraordinarily obvious--yet at the time, photography was still a fairly new thing, and we hadn't become quite so accustomed to fakery. Fast forward to now, and we see even more photographic faking. People are copying missiles in faked launches, or removing unsightly telephone wires. So we need to learn a few skills in detecting what's real and what's not. As you might suspect, I'm going to argue that we need better SearchResearch skills! So here are a couple of Challenges for the week. We'll start with easy, and get harder as we go along. 2. How could you tell if these hotel reviews are true or faked? Review 1: Stayed here for two nights with my wife and golden retriever in a pet friendly room. All staff in the hotel are super friendly and helpful. Can't beat the location. Visiting our son at Dalhousie. We are traveling from Maine and have greatly enjoyed Halifax. If you are into jogging, you can leave hotel and make loop in the point. Review 2: We only stayed for one night but I would have happily stayed here longer. The hotel is beautiful throughout. We upgraded our room for a good price and had a really nice king bed which was really comfy. We ordered room service too for breakfast and were very impressed how quickly the food came. 3. In this political season, many quotations from famous people (e.g., the Founding Fathers) are being bandied about. Which of these Jeffersonian quotes do you think is real OR fake? Quote 1: “Do you want to know who you are? Don't ask. Act! Action will delineate and define you." Quote 2: “That the obliquity of the ecliptic, when these elephants lived, was so great as to include with the tropics all those reasons in which the bones are found." As always, let us know how you figured these Challenges out! 1. Hard. Will try later. Just for the writing style, I suspect quote 2 might be right (in spite of an apparent typo, reading "reasons" where "regions" would make more sense). I also suspect quotes 1 and 3 might be misattributed. Quote 2: [ "obliquity of the ecliptic, when these elephants lived" ]. Google Search, Google Books and Amazon all find several books attesting the veracity of the quote (and also that I was right about the typo). Quote 1: [ "Action will delineate and define you" ]. Second Google Search result is from Monticello, an article in the Thomas Jefferson Encyclopedia filed under "Spurious Quotations". Interesting page. Quote 3. Now that I found this Monticello page, I can search the Encyclopedia directly there. [ gun control ] gives another spurious quotation, "Strongest reason for the people to retain the right to keep and bear arms". On the comments, "gun control" is mentioned twice, including "Anti-gun control web sites are promulgating dozens of such quotations from the founding fathers -- most of which make the fathers sound oddly like Wayne LaPierre. The quotations are all of a size that makes them suitable for copying and pasting into the comment streams of online news stories." So, back to my first strategy (without the quote signs now, because "the people who are" seems redundant and thus a sign of either oral speech or flawed recalling): [ Gun control works great for the people who are law-abiding citizens ] gives several credible sources. The 4th one on my SERP is from Politicsusa, which I have the impression of being credible but then its snippet reads "“Thomas Jefferson himself said, 'Gun control works great for the people who are law-abiding citizens …". Hmmm... I open the page though and I get it now. This is a quotation of what Ben Carson has said in at least two recent occasions. Although the site is opinionated and maybe biased (disclaimer: I share those opinions, in fact), it seems to be well documented, including a link to one of Monticello's "Spurious Quotations". Back to challenge 1, because it doesn't seem to be as hard as callenge 2 anyway. The jet plane looks a little too big to be true. Taking from the perspective, it's easy to see that this is a wide angle photo. A telephoto lens would approach distant objects a lot more, and that would be the only way for a distant plane to appear so big. Anyway, I tried to search for the image both on Google and TinEye. Nothing. On Google though, the words suggested were "city hall" and, on one of the pictures shown, I found the building to be the Philadelphia City Hall. On Bing Maps I confirmed the buildings behind the city hall are indeed those shown on the photo, if you use Bird's Eye view to look westwards. Now let's check the possibly spurious element, the plane itself. Snipping only the plane and searching for it gives a perfect match on both Google Image Search and TinEye. TinEye is more practical here and leads me directly to an image of a F-16 fighter of Hellenic Air Force during a solo demo flight at Tanagra Air Base, Greece. It is clearly the same photo. I am had the same result using a Google reverse image search, where google guessed the words [city hall] for this photo. This this made me super intrigued as to how the word guessing works for reverse image search works. Because when I replaced the word [city hall] with [.] the results showed images of clock towers and spires from around the world but it didn't seem that any of them were images of city halls. City halls only seem to come up when you add the word [city hall], so how did the guess get made? Does anyone have any insight or interesting observations on how this word guessing works? As to challenge 2 (the fake or legit hotel reviews), my first thoughts were also to search for distinctive snippets of those sentences. Review 1 seems legit, being from a "Level 5 Contributor" on TripAdvisor (here). But it needs double-checking and I haven't thought of a good strategy for this to be done. And Review 2 is not as straightforward to find. So I needed to find a new strategy. Google Search [ how to find if a hotel review is legit ] gives several articles dealing with the subject. I head directly to the 8th result on my SERP though, because it's a site title Review Skeptic whose search results snippet is promising: "Review Skeptic is based on research at Cornell University that uses machine learning to identify fake hotel reviews with nearly 90% accuracy." According to Review Skeptic, both reviews are Truthful. When I have some more time, I will read some of those articles and subsequently try to substantiate this answer furthermore. Good day, Dr. Russell and everyone. Thanks Luis for the comment and your help. I tried different things and never thought about the path you share with us and is great. Thanks! Looking photo looks fake because how Sun hits buildings and not the airplane. Q3. Selected the whole text again. A. Fake. Sun looks different in building than in airplane. Review 1: Hotel is Pet friendly and data looks real. Review 2: Author has many other reviews and talks specific about hotel. Review sounds too "good" so I think is made by someone who works for the hotel. Quote 1: “Do you want to know who you are? Don't ask. Act! Action will delineate and define you." A. Fake. …something still seemed off about the Philly location — then I noticed the cursor in your photo - a pretty good indicator it was under the digital knife. — and then there is alway the innocuous typo… what's a 'gluten retriever'? "Review 1: Stayed here for two knights with my gluten retriever and wife in a spouse friendly room…"
Hello Remmij, Luis, Jon and everyone. I didn't notice the typo, Luis and your sister job's sounds very interesting. As you mentioned, that site is very good and reliable source. Remmij, how did you noticed Greek airplane? I saw the link you posted but you knew it before that, right? That shows is fake. About cursor, I also noticed but thought it was in my lap not on photo. Cursor could be in real photo if we do a screen print with it. Great catch in both cases. When read about 'gluten retriever', thought I had big vision trouble and re-read original post. Glad I didn't miss that retriever! I will visit the links and read again comments to find and learn more. while searching and some of the methods used by his investigative reporter colleagues? Also about search and the deep/dark web as opposed to the clear web? found some other related images as I poked around… real or different real? …finally, after all that, was feeling a bit out of search-sync so signed up for the 90 second searchResearch express refresher course. fwiw: good tip/reminder rrRosemary! - on how to search the review quotes - use fragments, not the whole. (btw, enjoyed the Calder generational background - reminded me of the Wyeths - like Sandy's "Ghost") nice research on the heels of the Mercury Fountain, Ramón. 1. The plane: Hard shadow from tail section showing sun is high overheard, yet the clock shows 10 past 7. No shadows at all in the rest of the image. BUSTED. 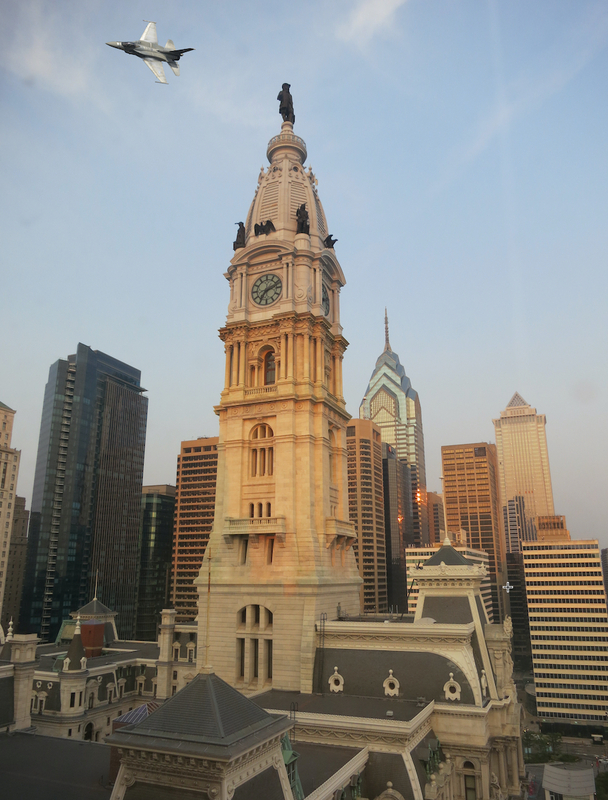 Search shows Ben Franklin's astonishment at seeing this plane over his Philadelphia City Hall. So what's the matter with kites? 2. [reviews real or fake] finds lots of help. I searched entire sentences to see if anything showed up online but none did so thinking now both are real but unpublished. http://reviewskeptic.com/ By Cornell University will check the veracity of a review. So here goes. It says first one is Truthful. Looks like a tossup to me. Second: Also Truthful. It claims 90% accuracy. Status: We currently have no evidence to confirm that Thomas Jefferson ever said or wrote, "Do you want to know who you are? Don't ask. Act! Action will delineate and define you." This can be unequivocally attributed to Witold Gombrowicz. How it came to be attributed to Thomas Jefferson is unclear. Scholar in Notes on the State of Virginia by TJ 1787 has this cited 2201 times. (great tool find) and the TJ quotes! nice job gentlemen. that's why I enjoy sRs - learn something new every time. Off to hangout with my new pixie friends… oddly, they are Google-less - who knew? Good day, Remmij. Thanks for sharing the fairies link, your photos and the story about dunce cap. If you are in the corner with that hat, make some space for me :) You are so much better searching and creating content than I am, so it will be an honor to use that cap next to you. I just read this article that adds something else to Real or Fake problems. Can the vocabulary of deceit reveal fraudulent studies? Philadelphia's City Hall is the largest, tallest and most expensive of all city halls in the United States. Since no steel frame was used, the walls at the first floor are up to 22ft thick to support all the weight from the floors above...The massive statue is 37ft high and weighs 27 ton. It is just one of 250 sculptures created by Alexander Calder for both the interior and exterior of the city hall. The History and Mystery of Philadelphia City Hall [Fallout Shelter sign] From Wikipedia: A fallout shelter is an enclosed space specially designed to protect occupants from radioactive debris or fallout resulting from a nuclear explosion. Many such shelters were constructed as civil defense measures during the Cold War. From Sculptor to Mobile Creator: Three Generations of Calder Artists Calder spent nearly 20 years sculpting around 250 figures for City Hall. Not so sure backgrounds are different. To verify I tried to find images from same angle in Streetview and photos but I found nothing. So I considered angle of the jet; altitude;lack of jet stream; perspective; light; shadows, time on the clock; lack of data in EXIF; and despite all this I am left with doubt. So rather than focus on the buildings etc I chose to crop the jet and see if I could find an original on the internet. I got only one hit - http://bit.ly/srs_15_Nov_2015 - and if you look at the image with the jet over Phily and the jet found in my Google Image Search I think these could be a match. (ignor the pixelation of the first image because I had used the zoom to look closer & didn't go back to 100%- look at the image above.) http://i.imgur.com/J58prAe.jpg What are the chances we would get an exact match? Second review caught my eye. Why? because of the reviewer, Madeleine 75. Check her profile and you see she is a top reviewer. But as well I noticed looking at individual reviews that she may have been in more than one hotel on a given day. I know she may have posted at one time but there are too many reviews. Also she is very lucky because her reports are very positive all the time. Review #1 Profile of Mark b has only a few reviews which are not all glowing. Looks positive but I would still look for more reviews. I should have said on the reviews that I selected a portion of the text to find the source of the reviews"The hotel is beautiful throughout." as trying to match the whole review would likely not give good results. Answer: Fake or real? How do you know? Answer: Fake or real? How would you know?